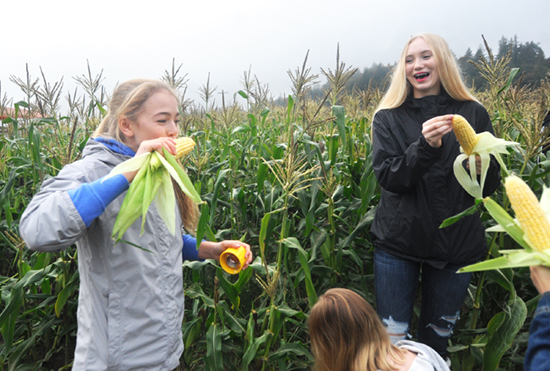 Glacier Peak High School freshman Ellie Middendorf (right) watches as fellow freshman Adie Stratton takes a bite out of a just-picked ear of sweet corn as the two were on their school culinary program’s tour of Bob’s Corn farm near Snohomish on Wednesday, Oct. 10. SNOHOMISH — When walking the halls of Glacier Peak High School in the fall, it’s not uncommon to smell freshly-baked pumpkin bread or warm apple sauce in the air. The smells are coming out of Jamie Mesman-Davis’s classroom, where students are hard at work preparing their creations. The students in her culinary classes are getting a hands-on experience with local ingredients, thanks to the help of a few generous Snohomish farms. Mesman-Davis has been teaching in Snohomish schools for almost two decades and teaching at Glacier Peak since the school opened in 2008. She noticed that many of her students were not connecting where the ingredients they were cooking with came from. She was also finding once students began cooking 4-5 days a week in her classes, it was stretching her class budget. So, Mesman-Davis, decided to take matters into her own hands. A third-generation graduate of Snohomish High School, Mesman-Davis grew up with many of the area’s farming families. Because of her knowledge on the farming culture in Snohomish, Mesman-Davis decided to ask local farmers if they would provide ingredients for the classroom, and give tours of their farms to students. The farmers were eager to help. Now, her students are frequently cooking with donated produce from local farms and taking field trips to learn about where their food is coming from. Last week, Mesman-Davis took about 140 kids on a field trip to Bob’s Corn so they could tour the corn fields and learn from farmer Bob Ricci himself about growing corn. Bob’s Corn has also been generous in donating pumpkins to Mesman-Davis’s class. Mesman-Davis said she finds joy in showing students how to cook pumpkin and use it in recipes, rather than just going to the store and buying a can of pumpkin. Another farm that has worked with the class is The Farm at Swans Trail, run by the Krause family. “We just went to get apples from the Krauses on Monday (Oct. 1) and they told us to let them know if we needed anything else,” Mesman-Davis said. The students use ingredients fresh and then freeze the rest so that they can use local produce throughout the school year. Mesman-Davis said that the students look forward to their farm field trips. She said one student asked at the beginning of the school year if they would be visiting the farm again, because he was excited to get to eat raw corn in the field. Other farms that have helped out with the culinary classes include Chinook Farms, Bailey Farm and Craven Farm. Mesman-Davis is thrilled to see her students learning about where their food is coming from and hopes they become passionate about cooking with local ingredients and pass that excitement along to their families someday. Ricci agrees. “I am hoping that they learn how much better tasting produce is when it is fresh as opposed to being days old from the grocery store,” he said. Mesman-Davis is seeing the partnership between her classes and local farms grow deeper every year, with farmers checking in to see how their ingredients were used and what students enjoyed.